[PROMO] For stays longer than 6 nights, CLEANING COSTS AND KIT OF TOWELS (€ 80.00) INCLUDED IN THE PRICE! 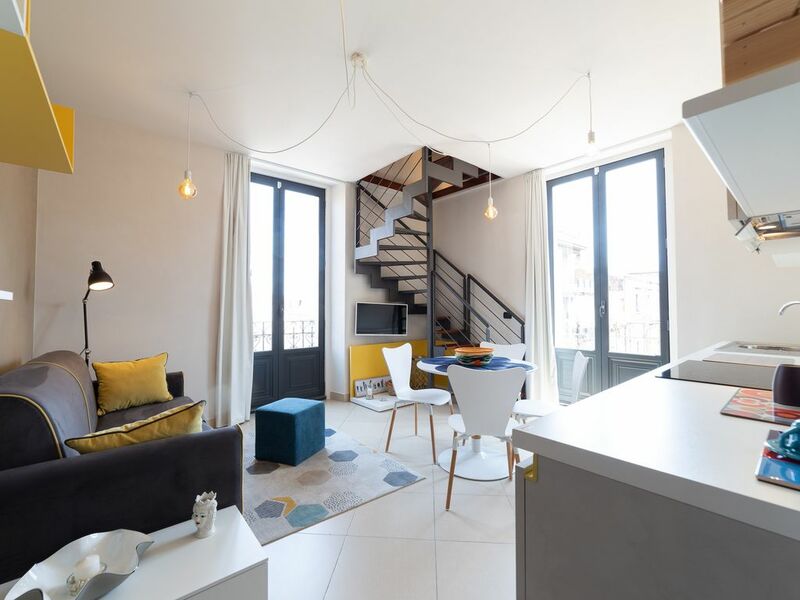 A beautiful apartment completely renovated on the first floor of an ancient historic building in the heart of Riposto, a city of fish and the sea. Suite Apartment Cavour is located a few meters from the main street, "Corso Italia", famous for its shops. It is the perfect place to enjoy a holiday in perfect Sicilian style: close to the colorful fish and fruit market, several bars, a typical cheese shop, and a few meters from pizzerias and restaurants, supermarkets and pharmacies. The interior of the suite is furnished with style. Illuminated by two large windows, it is on two floors with a full kitchen and the induction hob, in open space with the dining room and the living room with a sofa (the sofa can be used as a sofa bed on request only for children), LED TV with smart TV and air conditioning, and a bathroom with a shower and a small balcony. Upstairs a modern bedroom with a hand crafted bed and a 42 "television and air conditioning. From the bedroom you can access the private terrace and divided into two spaces: a laundry room and one to relax. In the whole house there is free wi-fi (20MB / s) and unlimited. The tastefully furnished apartment in modern style is perfect for 2 guests looking for an unforgettable holiday to discover the real eastern Sicily. The staff SunTripSicily organizes at the request of its guests: cooking lessons to delight you and learn the Sicilian culinary art, wine tastings in the wine cellars of Etna, boat trips and 4x4 jeep on the highest volcano in Europe, service delivery at home, car rental and transfer to / from the airport of Catania and all the destinations that deserve to be visited during a stay in Sicily. SunTripSicily is our territorial tourist service. We share our love for Sicily with our guests and recommend the best way to discover and experience our Island. We act as concierges and troubleshooters, ready to be on hand 24/7 from the moment of booking and for the entire duration of the stay, always at the end of the phone and always ready to meet guests' wishes. The services are handled with care and professionalism by our team that regularly visits our properties, knows our destinations very well and will be expertly placed to answer any of our guests' questions. This newly renovated apartment is perfect for those wishing a romantic and relaxing getaway in Sicily. It offers all the comforts of modern living combined with a relaxing and welcoming atmosphere in the earth of Riposto city center. Brand New Apartment! SELF CHECK-IN IF REQUESTED! Unlimited WI-FI access from all the areas of the house. Brand new Air-Conditioning in all the areas of the house. Stylish and modern furniture. Walking distance to Bars, Restaurants, Pizzeria, Supermarket, Fish and fruit Market of Riposto, Chemist, 30mt to municipal garden (Villa Pantano), butchers. 500mt to the train station of GIARRE-RIPOSTO so perfect for any kind of movement around the east coast of Sicily. Suite Cavour has a convention with the private shore LIDO LUNA ROSSA, in Fondachello Beach: for the duration of your stay from the last week of May to the first week of September, beach umbrellas and beach chairs will be set aside for you everyday including in the rental price! Inside the Lido you will find a beach volleyball field, children's play area (with expert animators), a café bar serving meals all-day, pedalo hire, wine and cocktails bar etc. We organize on our guests’ request: cooking master classes to enjoy the Sicilian tradition with food; wine tasting in the best farms of Etna; boat trips and visits to volcanic craters; shop at home. Little Laundry outside in the terrace. IS POSSIBLE TO DO AT SELF CHECK-IN ON REQUEST. Called "LIDO" In the summer time (from the last week of May) our SunTripSicily guests will also have included "ENTRY + SUNBEDS + assigned UMBRELLA" in the private small pebble beach LUNA ROSSA "for the duration of their stay. Bar, solarium, beach volleyball court, beach life guards, entertainment and much more especially in summer time. very well equipped apartment in the city center! We spent a few days in Riposto (4 nights) before nye. It was pretty cold outside but luckily we had good air/co heater and the temperature was perfect inside the house. The apartment is comfortable, bright, well equipped and easily accessible to many great destinations. Our hosts Giovanni and the organization took great care of us and responded without delay to queries. There are great restaurants and bars within walking distance and the train station is 10 minute away. It was our first time in Sicily and this venue was perfect. We had a little problem with the main door key but was solved very quickly. Would definitely stay again. This apartment is comfortable, bright, well equipped and easily accessible to many great destinations. Our hosts Giovanni and the team of suntripsicily took great care of us and responded without delay to queries through the holiday season. Renting a bicycle, hiring a car, finding a good hairdresser was no problem or simply taking the umbrella and chairs that they provided to the beach made for a perfect day. There are great restaurants and bars within walking distance and there is a lovely ambience in the neighborhood. It was our first time in Sicily and this venue was perfect. Thank you very much for your thoughtful and kind feedback! We of SunTripSicily are really happy that you appreciated the easy access to the best hot spots of the Ionic coast from our apartment and its great position at a walking distance from all the useful services. Furthermore our SunTripSicily staff is really glad that you noticed the prompt of our answers and the efficiency of our services designed to make the holiday of our guests unforgettable such as the bike hire perfect to delight the panoramic waterfront cycle line nearby the apartment and the sunbeds and umbrellas reserved for you in a private equipped beach to enjoy a day by the sea. Very, very welcome back anytime!! We booked this suite looking for a cozy place that could welcome us during our trip in Catania. Well, great experience: Giovanni is a perfect host and the Suite is beautiful. The furniture is incredibly nice and the house is equipped with everything. The area is full of typical shops, bakeries, pizzeria and goooood café. Just cross the road and find the public garden: not so big but super nice. The sea is like 5 minute walking: but first don’t miss the fish-market in the main square. Great experience. Such a Beautiful location. Close to the beach and the area is full of nice shops. In a few minutes by car you can reach Catania, and Taormina as well. The decor and design of the room where an absolutely delight.. Staff was extremely friendly and helpful! They really tried to make sure you have comfortable stay. Would definitely be going again! The apartment is located in the historic fish city center of Riposto. The restaurant offers an excellent mix of sea, mountains, peace and quiet and the bar and restaurant.